A reviewer at the Washington Post said of this book: “Every sentence is as solid as brick.” I for one completely agree. The problem is that the book also felt as heavy as a brick. It took me 4 weeks to get through, which is probably a record. Don’t get me wrong, I love me some intricate, intellectually-challenging story with lots of characters. All I ask is that it keeps me interested. But for all its cleverness, one thing An Instance is not, is a page-turner. After reading the mostly raving reviews, I can only conclude this is a typical case of a series of unfortunate expectations on my side. The idea behind the book is great: a murder in 17th-century Oxford against a backdrop of political conspiracy and academic intrigue. Four unreliable narrators, each believing they have the key to the mystery. The first three go up to a certain point in solving it, but then let their obsessions take over and begin bending the story to their own will. So far, so good, right? I was expecting (mistake 1) a clever POV plot, with the same event being perceived by the characters in different ways. However, Pears doesn’t put us inside his characters’ heads, so all we do is read what they wrote for posterity, which means they very often lie… or are raving mad and start making things up. This took half my fun away. When I came to the second character and found him was as flat-toned as the first I started to wonder if the book was really worth the investment. I though the first POV was dreary because that’s how Pears wanted to portray this particular person (mistake 2), but I found the exact same voice in the others. Still I labored on because most people told me the fourth character was the best, the one who sheds the light on everything. So I began expecting (mistake 3) a sort of The Usual Suspects: an ok story made brilliant by the mind-blowing ending. The problem is that by the time I came to the fourth character, I was in the mood to do little more than skim. In the end, the story’s culmination was a terrible letdown and the ultimate fate of Sarah Blundy (wrongly accused of the murder) was so implausible it just had to laugh a bit***. Even the true identity of the mysterious character 1 and his real reason for coming to England were a stretch in credulity and that’s putting it mildly. So that’s that. But because I don’t want to be too harsh (do you know how many good books I could have read in 4 weeks?!) I will say this for An Instance: technically, it is well written. The research is meticulous (although you have the feeling at times that Pears wanted to use all his note cards by force if necessary) and I couldn’t find any holes in the plot. Unfortunately, these three factors put together just didn’t do it for me. 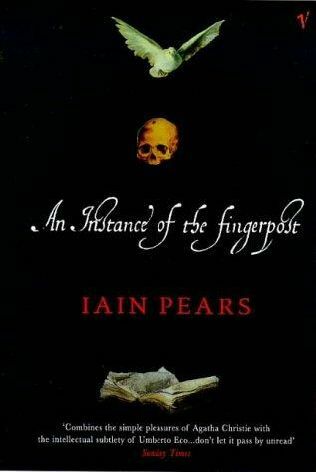 However, I will not give up on Iain Pears, he’s too much of a favorite of fellow-readers who’s opinion I highly respect. Also, I’m completely intrigued by the premise of his art history mysteries, it seems right up my alley. Did I understand that correctly, Sarah was that generation’s Jesus??! Also, didn’t you figure out she wasn’t dead when we first see the description of her supposed autopsy, where she was cut “beyond recognition”? The few things I’ve read about this book prior to your review was that most readers had a hard time sticking with the novel, I guess because they had the same “lack of interest” issue that you did. I’ve read good things about Pears and there are elements about this novel that sound intriguing, but I’m pretty sure this wouldn’t be the right book for me! About plot details, it has been a while. About Sarah and your first question, yes. Second question, I think so took, but do not remember. I know for sure I do not have to like the main characters to like a novel – even when they are the narrator. In fact I can adore a novel where I loathe the main character ( stuff like A Debt to Pleasure for example) and IP kept the pace fast enough that i really liked this. But surely if you loathed 3/4s, it won´t be enough pay off! I also got a weakness for conspiracy theories of the big big kind, so it all worked pretty well for me. Back to liking characters, that is a true turn-off for some readers. I know I do not mind, my personal turn-off is when I dislike a character very much that the author thinks is likable and expects me to like or identify with. This happens quite often – trying to write a review of a book where I found out I really dislike the main character (And worldbuilding) but which a friend just praised the characters ( and worldbuilding). sigh.. I was getting all excited when reading the premise – what a pity the execution didn’t live up to it I’d expect Pears to use the multiple POVs in that exactly same way you describe. It’s really too bad it doesn’t, and also that the voices sound samey. Yay! I mean not yay that you didn’t like the book, umm yay that somoene else feels the same way as me – misery loves company right? I’m usually not this harsh, but wasn’t this book a huge timesucking waste? I didn’t make it to the fourth part, because although I could have read on I just didn’t care enough. I was apathetic towards finishing a book – that almost never happens. Agree all the voices are the same (and they are all the same in a dull way). ‘Oh turns out he was mad’ – what was the point of that, did it make sense when you got to the end? @Steph: I must admit I was a bit intimidated with the amazing reviews I saw everywhere. It got me thinking “what is wrong with me”? I still haven’t really adopted the life’s too short theory to reading as much as I should. @Nymeth: I know! All about expectations and the traps of the cover blurb. summaries. @bookgazing: one of the biggest joys of book blogging is to know you’re not alone when you dislike a book that seems to be universally adored. On the other hand, I was pretty harsh about The Eyre Affair when commenting on another blog and no one agreed with me… On that one, I must continue to search for a partner-in-dislike.